Reclining in the San Francisco offices of Warner/Elektra/Atlantic Records, album producer Nicky Ryan explained the creative process of his collaborator/proteg?, Enya, currently one of the hottest young talents on the WEA-distributed Geffen label. But from across the room, Enya's brown eyes flashed as she countered through pursed red lips, "It could be only days." In the chair where she sat, the slightly-built keyboardist/vocalist, obviously miffed, folded her arms in very Irish defiance. "Weeks," Ryan repeated in a fatherly tone; then - in no mood for a long confrontation - he apologized. "Well, we do have some tremendous fights," he demurred while Enya continued to scowl. "But it's constructive as well. It releases a lot of steam and gets us back on the rails again." The relationship between the elder Ryan and the mid-20-ish Enya (last name, an inconvenient Bhraonain) may contain conflict, but it's proven to be remarkably successful. The team, which includes Ryan's lyricist wife, Roma, has become a chart-topper in their native Ireland with a music so intricately constructed in the studio that it cannot be reproduced live. At home, Enya's self-titled debut outing in 1988 was kept out of the No. 1 chart position by only one group - homeland superstars U2. Originally a soundtrack for a BBC television special, The Celts, Enya displays lush instrumentation and stunning vocal texturing. And it paved a path into the UK Top Five for the singer's latest effort, Watermark, released in January of this year. 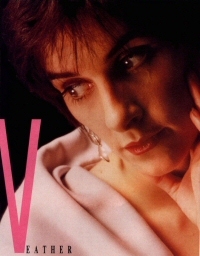 Creating soundscapes rather than traditional pop songs, a surprised Enya has watched her Watermark single, Orinoco Flow, become a European pop smash. The "children's skipping song," as Ryan describes it, also is winning over America - getting airplay on U.S. Top 40, New-Age, and progressive-rock stations, as well as MTV. Attired this day in a loose-fitting black dress, the diminutive Enya was almost lost in the large armchair. Emily Dickinson comes to mind. Admittedly "extremely private," she was soft-spoken and shy about her music and its demands, that have made her an artistic recluse in Dublin. "Because of the intensity of my work, I've had very little free time," and asked but one thing from Geffen upon signing: "to be left entirely alone." Ironically, Enya had never planned on a recording career, much less to find herself one day in San Francisco promoting her craft. She was, she said, quite happy studying classical music theory in college when Ryan stepped into her life. "Now, I'm really happy I made the choice," Enya smiled as she brushed strands of hair from her forehead. Ryan smiled, too. He recalled how he and his wife, believing they had found a rare talent, had set Enya up in their home studio and given her creative carte blanche. "We became a partnership," Enya said of her mentor. "We talk about everything, and the three of us have to be happy about whatever we choose to do." Through countless hours of studio improvisation - utilizing a piano and a Roland D-50 synthesizer - Enya emerged with a fairly well-defined approach. Gifted with a crystalline soprano, she tracked her voice time and again until she had created veritable oceans of moody ambience, which flowed regally over a hypnotic Celtic undertow. It was no surprise then when one of Enya's demos reached the ears of BBC producers working on The Celts documentary, that they would soon have the composer sequestered in the studio again, writing and recording the entire score for the show. From that, Enya got a recording contract. Initially categorized as a New Age record by her first American company, Atlantic ("A cowardly thing for them to do," Ryan snapped), Enya is hard-pressed to define her ornamental, layered motifs. On Watermark she sings in English, Gaelic and Latin, but often opts for simple vocal nuances (like the sound-conscious pop ensemble, the Cocteau Twins). But her cornerstone, she insists, will always be a catchy melody. "That has to be strong, and what happens after I've written the melody is irrelevant to me," she lilted in her light brogue. One track on Watermark required more than 120 vocal overdubs before its author was satisfied. "I never listen to the radio - I don't like influences from anybody else," Enya feels this is important. Ryan saw fit to elaborate. "If you're a producer, you're supposed to know what's going on in the charts, but I'm not really into all that flavor-of-the-month stuff. To keep a uniqueness to what we do, it's important to avoid what's going on." "It's hard to categorize Watermark, and I'm happy about that," Enya added. "I don't want it titled anything." And, indeed, the music doesn't need a marketing category to be enjoyed. One listen to the oddly beautiful "sail away, sail away" sing-song chorus of Orinoco Flow (so requested by radio listeners that Geffen had to include the words, bracketed, on the single) give credence to Ryan's eight-year belief: "It's very hard to compare Enya to anything else." She blushed girlishly at the unexpected praise from Ryan. Suddenly, their disagreements were forgotten as Enya chalked them up to the pressures of the job. "There've been plenty of times when we thought, 'We're not going to record this album' and we walked away from the studio," she sighed, now in the pop world despite herself. "But a few days later we'd be right back in there again." "It's a nice process," Ryan concluded. "A very magic triangle." Note: Transcribed by Book of Days/TreeCat. I'm guessing at the date of publication. Enya was interviewed in Los Angeles in March 1989.